Welcome to my blogging universe!Hello! Welcome to the "About Me" page. You'll get a WHOLE lot of info about me and my work here. So read on to get to know me and my online work a little better than what you may know previously. About Me: A Boy And His Blog(s). • John's Blog Space (JBS) - This is a personal blog where the topic is simple: ANYTHING and EVERYTHING! It is about anything and everything that crosses my mind. Everything is discussed professionally, but as I call it, casually professional. I may discuss a certain topic often times, but this is not any kind of niche blog. So this means things like racing games, fashion, life issues, and more. The element of suprise alone in topics I select and when I post are usually worth the subscription to JBS! By the way... YOU ARE HERE on "John's Blog Space!" • John's Creative Space (JCS) - This blog was designed as an outlet to my own creative works. It also features insight on other programs and services for others to express their creativity. • John's Race Space (JRS) - Even though this blog is now called "John's Race Space," this blog was born as a blog dedicated to fans of the Gran Turismo series. Rather than just GT resources, I talk about a variety of other related topics to the GT series as well as other racing games. Formerly "John's Gran Turismo Space (JGTS)." • StyleSpace, by John B. Marine (SS) - The blog I call "StyleSpace" is devoted to fashion. It is not a "traditional" fashion blog. I have no formal training or exquisite taste in fashion that makes me any kind of elite. Instead, it is a mixed bag of topics that all have some relation to fashion. It is a look at fashion the way I best see it. In all of the blogging I do, my goals are simple- I want to meet new people and offer something just a bit different from other people. I care more about providing quality material and offering some positivity rather than be just another online entity indulged in Internet memes or using the Internet just to attack people. There's already too much negativity online and in society. Why should I contribute to that? You can think however you want about me, but I am about as real, honest, and as old-fashioned a person you'll ever encounter. • no racist remarks allowed. • no spam remarks allowed. Any comments that even remotely seem like spam will be removed (and maybe reported). • no homophobic slurs allowed. • any objectionable or suspicious material WILL be deleted (and maybe reported). Make fun of me and my blog at your own risk. • I don't go around hating on you and your blog, so why do it to me? I have done everything I can to ensure I get decency and involvement to my blog. I want to get more involvement from readers and (much) fewer spammers. It makes no sense to have so many people visit and only have so few people actually interact with my work. And usually, the ones who do comment are often times spammers just trying to put some suspicious link on my site. So if you're a loyal and respectful person, feel free to comment on my work. I'd like to hear/read from you! • Follow Me on Twitter (@johnbmarine)! If you want to be friends with me on Facebook, I invite you to click on the graphic below. You "Like" all these other pages... why not "like" me too? "Like" my Fan Page to keep up with my latest blog posts as well as my YouTube videos! Click on the badge below to get started! Thanks to everyone who "liked" my fan page. My blog and its entries are meant to talk about a variety of issues. While I do specialize in a few points, this blog entry covers random topics explained with my own level of expertise. I try to be professional in my blog entries though I am completely low-key in all that I do. You could say that I try to be "casually professional" in my blog entries. By joining various affiliate networks (including Adsense and Amazon Associates), I try to push my points further by allowing you the chance to visit Amazon to purchase items found in blog entries and in Amazon widgets. I want my readers and viewers and visitors to be able to purchase things on Amazon to help me profit from my work. I want to feel like my blogging work actually means something and that I can help out people in return for the words that I type. More importantly, I want my readers to get involved with my work. I invite people to comment, subscribe, read, Follow, and more. You show your involvement for other sites, so why not show my blog some love? Get involved! Greetings! 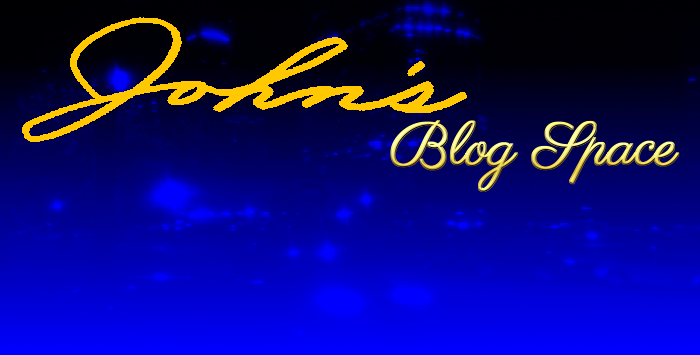 Welcome to my main blog, John's Blog Space. 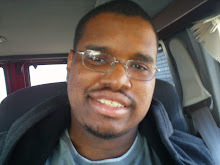 I tried to become serious about blogging since October 2009, so the next step for me is to try to get traffic and win the respect of viewers and readers around the world. My words and opinions are truthful and real. I prefer getting traffic and respect without lowering myself to any degree in the process. Whether you like me or not, all I ask from people is this: "give me a chance." Give me and my blog and my YouTube a chance. Don't have to like me or my material, but just give me a chance. I was born and raised here in Houston, Texas, United States of America. I'm probably sorry for this, but the only non-school thing I've taken part in was a Spelling Bee back in 1994. I got shafted. Ended up with 4th place. My life started to go downhill. Instead of having enough intelligence and passion to pass classes, I've stumbled. I once been to three schools in one year. I eventually graduated from high school in 2001. And to my surprise, I was the Most Improved Student of my class. Sadly, I ranked 15th out of my class' lonely 15 Seniors. I would go to Houston Community College's Southeast Campus for one semester to get into Lamar University. My disappointment grew even more as I lasted only 11 weeks. So I returned to Houston Community College-Southeast to get my Associate's in the Arts. I had my tough times, and though never receiving anything since 2001, I accomplished a major goal in my life in May 2008 by getting my Associate's in the Arts. After my Associate's in the Arts triumph, then came another challenge- where to go for a Bachelor's? This only led to more questions and fewer answers. And I assured my brother that I'd stick to a major that I can get a degree in and start a career towards. Unfortunately, I became even more unsure about my life and decided to go with YouTube videos and blogging. I had changed my major goals from Computer Animation to Graphic Design to Broadcasting and Journalism... until I eventually decided to go with blogging and concentrate also on YouTube videos. Because I don't know what I actually want to go to college to get a Bachelor's Degree in, I decided to just try and profit from the arena of online media. But I want to honestly profit and not lower myself to using sneaky online material potential of spamming my computer and hacking all of my stuff. Unsure of where to go with my life, I stopped having any sort of college aspirations and decided to stick to blogging and YouTube. Apparently, I started this blog back in May 2007. I started posting material back in January 2009. I was not serious about blogging at this time. But it wasn't until I was blogging more often starting in at least September or October. Then to try to build up my online work, I went ahead to get my own bank account to apply for Google Adsense to profit from my blogging. I felt this was going nowhere, so I then went ahead and joined Amazon Associates to further monetize my blog. I even used Google Adsense to monetize one of my YouTube videos which earned me 4,000+ views in two days. At my current age, I'm ashamed that my life could have progressed much better. Most people my current age have already moved on with their lives. You know- people who probably have their own families. Happily married. I didn't know what to do with my life, so I went ahead and just do what I've wanted to commit to. I may go nowhere really positive in my life, but at least I'm doing SOMETHING with my life than play video games and sleep while life just passes me by. To learn more about how this blog is monetized, please read Affiliate Notes. It includes important information involving various affiliate programs I am associated with. To monetize my blog and to feel like I am actually profiting from my work, I joined Adsense and Amazon Associates. I use Amazon Associates to showcase and highlight on certain items. I feel the best way to share ideas on something is to feature actual items (which you can purchase) relevant to the topic(s) at hand. Rather than be some corrupt salesman online, I want to help people get things online via Amazon. The majority of me using Amazon Associates is mostly in some of my fashion discussions. I've been using a lot more Search widgets lately to aid in helping people find whatever they want based on things I cover in my blog. The reason why I'm doing all of this is because I want to offer you things in return for visiting and reading my blog and its entries. I don't force you to buy things. Instead, I'm sharing these things because if you like my blog entries on certain topics, you should be able to have your own piece of the pie. So I do everything I can to express my views to all of you while also allowing you the chance to buy certain products from Amazon. I want to assure to all of my readers that you all mean so much to me. There were times where I felt like nobody cared about me or wanted anything to do with me. There were times where people I thought were friends left me. Being noticed (without being harassed) is everything to me. You come here to visit my blog and do some reading, but I also want to return the favor to you by sharing things online relevant to some of my blog discussions. You aren't required to do some online shopping, but you are really encouraged to at least check out certain items I feature. If you see something you like, please click on the item and order it. I would really appreciate this as you help me to realize that my work DOES mean something and that I can profit from my services to you. Will you help? Now that you know just about everything about me, here is one more chance to connect with me online if you didn't do so earlier. I want my fans to connect with my work. Don't be shy- let me know you care! Thank you for reading! Take care and be well. Now go enjoy my blogs!